On our second day in Chicago, we woke up early and started walking to the train. We were running just a couple of minutes late, so Tanner suggested we start thinking about hitchhiking. I actually didn't think he was serious, but in fact he was. We started speed walking, and we instantly started dripping sweat. We picked the most humid weekend to visit-lucky us! I also had my bag full of every single one of our cameras, water bottles and food, so running with that little guy wasn't too fun. Also, I decided to wear a romper with a snap across the chest...and when it was mixed with the pulling of my bag and running, it kept un-snapping! It was so embarrassing!! Anyways, we made it to the cutest train station with a minute to spare, and headed downtown! We started our day off with visiting Wildberry Pancakes that was recommended by the Fabrizio's, and it did not disappoint! We would highly recommend eating here for breakfast, it was SO delicious! And, the restaurant is huge so your wait goes by fast! We were also really impressed with the food prices in Chicago...it felt so much cheaper than SF! If you know me, you know how happy I was with the Lemon Poppy seed pancake special! I'm still dreaming about it. The night before, we scored a Groupon deal for a Seadog Architectural Tour, and got an extra 10% off on top of that deal. What I've learned from living in a major city, is that you can usually always find a deal on Groupon or some travel site, so make sure you check! Seadog Tours are SO great. They are funny, entertaining, and super informative-we learned so much. 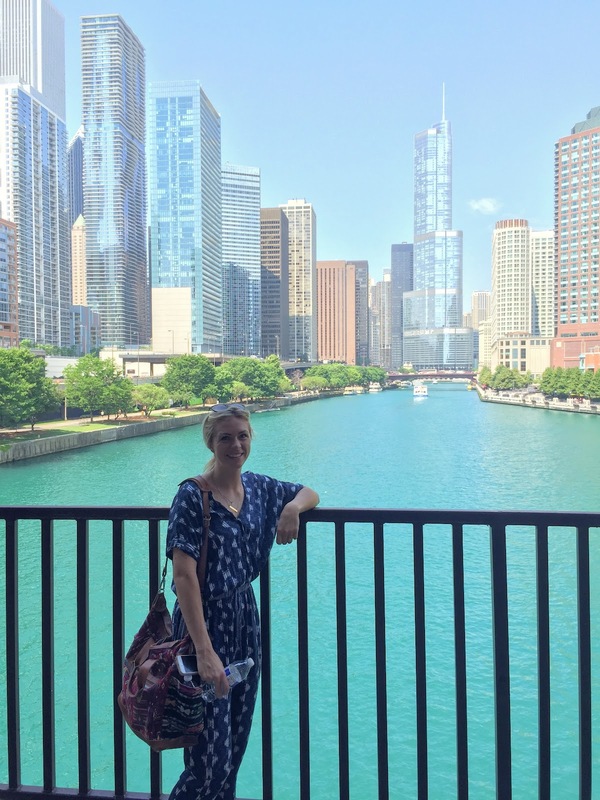 We got to go out on Lake Michigan really fast, and come back into Chicago River and learn about all the cool buildings. We would recommend a tour at sunset during the summer. We had so many things we were packing into the first day, so we wanted to make sure we had enough time to get everywhere we wanted, and went with the 1pm tour. If it wouldn't have been so hot and humid we would have been fine, but those hot leather seats don't do much to cool you down! I guess I was also imagining being on a boat like "My Best Friends Wedding", but there was no head coverage. We had a really good time, but the second the boat stopped I ran into the Navy Pier to hopefully cool off, but then I remembered that your sweat doesn't disappear like it does in AZ heat! I've always had a slight obsession with ferris wheels. We walked SO much this day, and saw so much of the city. At one point we were both so tired and hot we found a hospital that looked like it had good AC, and sat in there for a bit! I even took a really quick snooze. Embarrassing! I woke up to Tanner whistling over to me with a donut from Stan's Donuts. What a guy! We went to lunch at Shake Shack because we hadn't had it since our trip to New York. We planned on going to the new ones in Scottsdale, but never made time for it. It never disappoints! We love the Smokeshack burger, the fries of course, and vanilla concretes with caramel and toffee bits! Mmmm now I want some! 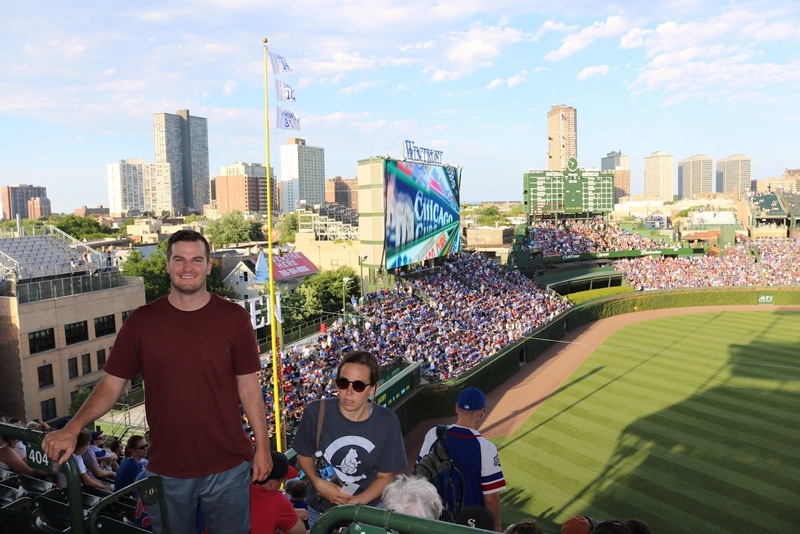 After walking the Magnificent Mile, and going in and out of all the fabulous stores downtown, we grabbed an Uber and went to Wrigley Field. We were skeptical of scalping tickets, but I think we found an even better deal. I don't LOVE baseball, but it was seriously cool to experience this legendary field with Tanner! We finished the night off with some jalapeno nachos, a Chicago dog, and a large Diet Coke- just like you always should at the ballpark! Oh, and some popcorn by our friends that sat next to us in the tiniest seats. I actually loved how they haven't really renovated the stadium much. The fans are also really great. I loved their accents! We had the craziest uber ride back to the train that night, and we could barely stay awake on the ride home! It was a fun-filled-packed-day! Christy and Trent picked us up from the station and we got to go stay at the house they were house sitting that night. We ended up hot tubbing until about midnight, and then started a movie after that. It was so fun getting to hang with our friends!